When her mother is diagnosed with a terminal illness, Celeste, 49, prepares herself to assume the role of a carer. A paediatrician, she is willing to arm them both with the logic of science: of cold medical fact, PEGs and the possibility of a life-saving drug trial. But her mother, a devout Catholic, is seeking other remedies. She fixes on the idea of the Nicula – an ancient wooden church in Eastern Europe rumoured to be a Lourdes-like site of miracles and healing, craving the comfort of a faith that Celeste chose long ago to give up. And so, along with her flighty younger sister Nathalie, Celeste finds herself reluctantly making a journey across the globe to Romania, caught between love, obligation and her own lack of belief. Central to Jacinta Halloran’s second novel (her first, Dissection, was published in 2008) is the question of perspective – not simply in the religious sense, but in terms of our beliefs about the world, and how they collide. Faith, or the lack of it, it could be argued, is simply the way we choose to process the complexities and pains of a life over which we have little control. 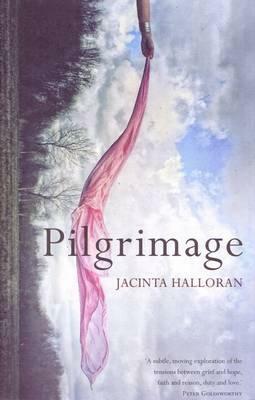 It’s tensions like these, as well as Celeste’s beautiful dimensions as a voice and character, that make Pilgrimage one of the best Australian novels I’ve read all year. I read it in one sitting and much of it has stayed with me since. Contemporary, elegant and serious, Halloran does a near-perfect job of capturing the nuance of what it means to be a daughter and a mother and a wife – to be stirred with both rage and empathy, and to long for life’s answers as deeply as happiness itself.